This is essentially a northern species, ranging south rather locally in the mountains to northern Georgia. With us, typical of moist and boggy coniferous forests and thickets, but grows in almost any kind of coniferous and mixed forests, ranging from jack pine and oak, or beech and maple, to tamarack or cedar swamps, as well as with aspens; persisting on eroded sand banks and in cutover forests; advancing into bogs (though not thriving on open mats). 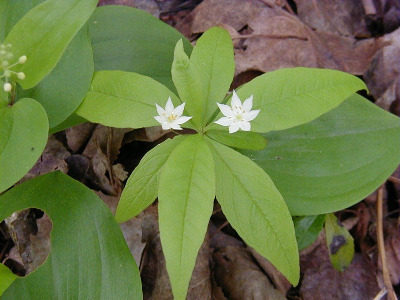 The attractive white corollas, usually with 7 petals united only at the very base, are open in the late spring and they drop intact, like fallen stars. MICHIGAN FLORA ONLINE. A. A. Reznicek, E. G. Voss, & B. S. Walters. February 2011. University of Michigan. Web. 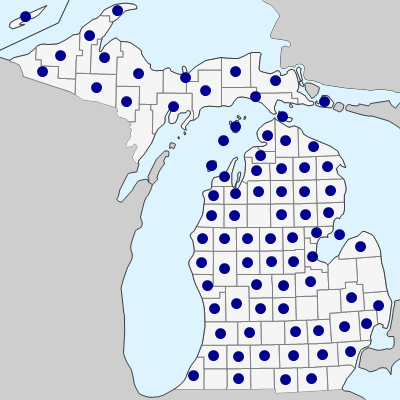 April 19, 2019. https://michiganflora.net/species.aspx?id=1719.